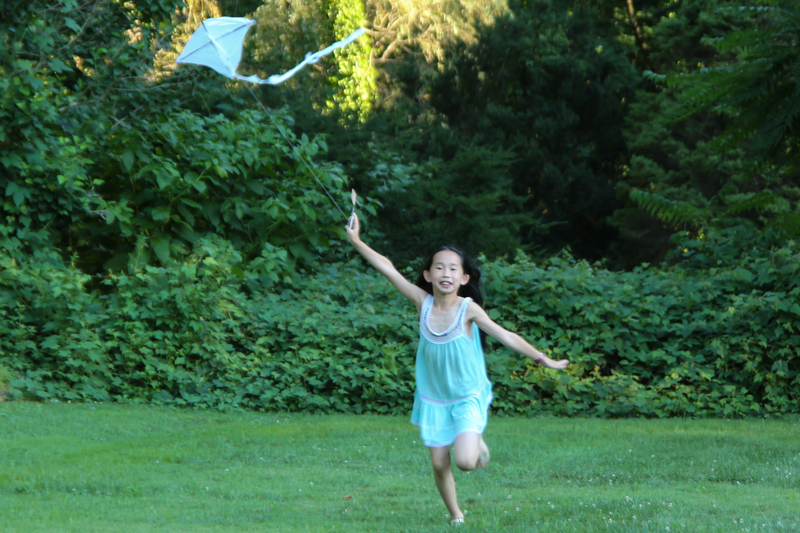 The first time I made the kite, I took it to Central Park to fly. In the park, it just spun really fast and crashed to the ground. We were in a hurry to get to Central Park and forgot to add a tail! The tail stabilizes the kite. Another big problem was that since the kite was made out of straws, every time a gust of wind came, it would bend the straws! Once we got home, we made a new kite. We slid skewers inside the straws to prevent the straws from bending. But when we tested it, the kite was too heavy from the weight of the skewers and it dropped.⇩ I took the skewers out and put two straws together to support the wings instead of one straw like in the video. Then, I added a tail. I put a lot of tape on the part of the straw where it had bended, making it so stiff that it didn’t bend ever again! (Hallelujah!!!!) The keel was not straight on my kite, so it soared through the air doing loops and dives instead of flying straight like my brother’s kite. But I liked it that way! It looked like a comet shooting through the sky! The tail looked beautiful streaming behind the kite. My brother said it looked like a Dragon. The kite was extremely light and even though there wasn’t much wind at all, I could run and the kite would follow me like a playful puppy following its master.